Presented as a clear introduction to the topics of climate protection and renewable energy, this book demonstrates the correlations between use of energy, energy prices, and climate change. It evaluates and analyzes the current world situation (drawing on examples given from countries across the globe), whilst also giving essential and practical guidance on 'personal' climate protection. Each major type of renewable energy system is covered in detail and with an easy-to-read approach, making it an ideal manual for planning and realizing climate protection and renewable energy systems, while also being an informative textbook for those studying renewable energy and environment and sustainability courses. Renewable Energy and Climate Change, 2nd Edition starts by examining our hunger for energyhow much we need, how much we use, and how much it is costing us. It then looks at the state of climate change today and the causes. Following that, the book focuses on how we waste and save energy. 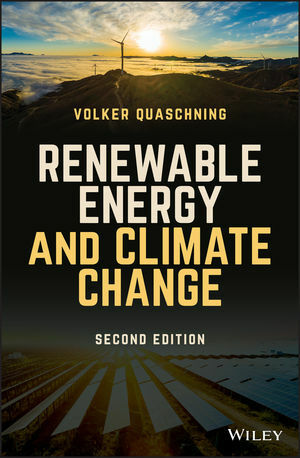 The remaining chapters look at the many alternative sources of energy generation, like photovoltaics, solar thermal systems and power plants, wind power systems, hydropower plants, and geothermal power. The book also delves into the current state of biomass energy and the hydrogen and fuel cell industry. It finishes with a look at the future of the subject, shining a light on some positive examples of sustainable energy. Renewable Energy and Climate Change, 2nd Edition is an excellent text for students and professionals studying or working on renewable energy, or environmental and sustainability alternatives. It will also benefit planners, operators, financers, and consultants in those fields. Professor Häberlin is the head of the photovoltaics laboratory at the Berne University of Applied Sciences (BFH). He obtained his academic degrees from the Swiss Institute of Technology (ETH) in Zurich, where he also worked several years as an assistant and assistant-in chief. After some years in the industry he took up his present appointment at BFH. He has been active in education and research in photovoltaic systems technology for about 20 years, has authored more than 125 scientific publications and is a member of Electrosuisse and IEC TC82, the international commission for PV standards.